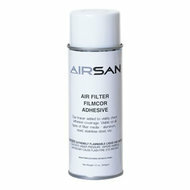 Film-Cor Adhesives - Airsan Corp.
Increase your air filter’s efficiency with Airsan Film-Cor Adhesives. A recharging adhesive must be applied to all permanent metal air filters after every cleaning service, regardless of filter manufacturer. Our Film-Cor is a proprietary tackifier specially designed for use with Airsan metal filters, but can also be used with other metal filter brands. After the filter media blocks particulate in the airstream, Film-Cor adhesive captures the particulate and prevents its reintroduction into the air. ALL PERMANENT METAL AIR FILTERS, REGARDLESS OF MANUFACTURER, MUST HAVE AN ADHESIVE APPLIED AFTER CLEANING. AIRSAN FILM-COR RECHARGING ADHESIVE IS NEARLY ODORLESS, HAS A HIGH FLASH POINT AND RAPID WETTING CHARACTERISTICS. A DYE TRACER IN THE ADHESIVE ALLOWS VISIBILITY OF COVERAGE.